The Daraphirom Palace was the former residence of Chao Dara Rasmi - a princess of the northern Lanna Kingdom. Now the Daraphirom Palace is still in good shape and the exhibits are well signed in English. Why Dara Pirom Palace Museum is special ? Phra Ratchachaya Chao Dararasmi was born in 1873, the 11th and youngest daughter of Phrachao Inthawichayanon, the 7th Lord of Chiang Mai. She was a beautiful woman and on a trip to Bangkok with her father she met King Chulalongkorn who took her as one of the Royal Consorts of King Rama V in 1886. 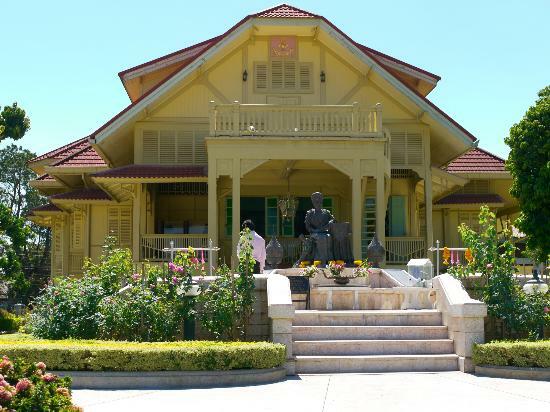 After the King passed away, she asked permission from King Rama VI to return to Chiang Mai in 1914, then she had her residence built, which was named “Phra Tamnak Darapirom” (Darapirom Pavilion). During her time in Chiang Mai, she had supported and initiated several projects on public health, education, agriculture, and local culture. She played a key role in maintaining Lanna cultural practices in Chiang Maiuntil her death in 1933 age 60. In order to honour her virtue, Chulalongkorn University had organized the project on restoration and development of the pavilion and the landscape in 1998, led by Professor Dr. Bundit Chulasai. What to explore at Dara Pirom Palace Museum? The history of Chao Dara Rasmi - a princess of the northern Lanna Kingdom. The Museum exhibits the gracious living quarters, textiles, furnishings, person utensils and musical instruments. You may also in advance telephone and request for an English speaking guide. The pavilion is Arts and Crafts style with a wide, long-eave roof which covers the attic with dormer windows. The front part is hipped gable, decorated with battens and fitted windows in the middle. This is one of the most interesting museums in the area and is well worth a visit. It tells an interesting historical story about the former Lanna princess who became a royal consort. The museum is in good shape and the exhibits are well signed in English. You can walk through the house seeing furniture and pictures of the times and family. There is a small admission charge of 20 baht per person. This palace or house is a little out of town but worth a visit. It shows how people lived long ago and showed the wealth of the king's consort. Nice displays and it is located in a police property. È uno splendido complesso di templi poco lontano da Chiang Mai, non incluso nei tradizionali itinerari turistici. È un centro di meditazione di monaci dalle vesti marroni. Gli edifici templari sono ricchissimi di decorazioni e pitture sia all'esterno che all'interno. Una vera oasi di pace.